What Is it Like to Be a Seamstress? There are two main types of seamstresses - custom seamstresses - which include dressmakers and tailors - and sewing machine operators. A sewing machine operator has the less creative type of sewing work and earns an average wage of $10.33 per hour, though it takes skill and the ability to operate an industrial sewing machine at a high rate of speed. In this position, the sewing machine operator typically does one sewing function of making a garment or textile item. Dressmakers and tailors get to enjoy more creativity in their work, as well as a slightly higher average wage of $12.30 per hour. Most sewing techniques for sewing machine operators are learned on the job, and generally revolve around quickly placing the fabric in the sewing machine and pressing the pedal while manipulating the fabric. Dressmaking and tailoring, on the other hand, require measuring, fitting, cutting, sewing and altering garments or creative textile art pieces. In a similar vein, sewing machine operators generally work in factories where they are not asked to develop creativity or come up with ideas. Dressmakers and tailors are typically consulted for design and fitting suggestions at each step of the garment creation process. Both types of seamstress will focus on working with textiles. There are, however, many different types of textiles that range from very light knits, woven materials, natural fiber fabrics, and synthetics, to heavy versions of each of those types of sewing fabric. Sewing machine operators are generally provided with a single gauge needle to do the single function requested. A dressmaker or tailor, on the other hand, will, at least at first, need to consult a sewing machine needle chart to ensure using the right type of needle on the fabric being sewn. I tried to write this without adding too much of my personal opinion, but you didn't click on this to get a dry rendition of what a seamstress does, right? You are reading this to see what it's really like. First, if you like sewing, it's a great job - but if hate sewing, you are not going to like it no matter what. I have worked on production lines as a sewing machine operator, and I really liked it. I like the fast pace and being able to let my imagination run while my hands do the same thing over and over. It's kind of mindless, but I find that freeing because my mins can still work on what ever it wants. I have also worked on the custom sewing end - and I love that, too. The challenge of measuring and designing and fitting are mentally stimulating - and seeing the finished items can be very rewarding emotionally. The two types of sewing are almost polar opposites - with the common thread (no pun intended) being the use of textiles and the sewing tools used. In my opinion, both are enjoyable and worthwhile, even though I have had jobs that paid more, few have been as rewarding overall, or provided as good a quality of life. It is so frustrating to buy a pattern and put all the effort into making something just to find out it doesn't fit due to discrepancies between the pattern company's sizing and that of mass merchandiser's sizing. That's why I decided to share this easy to follow video about choosing the right size Simplicity pattern. 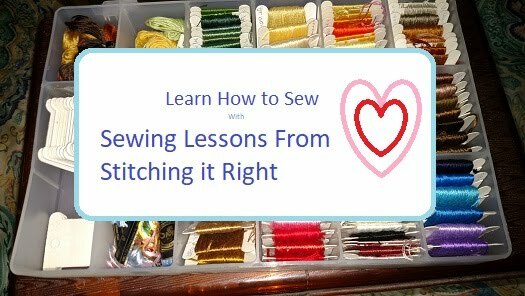 Make sure to watch it before you go shopping for a pattern for your next sewing project. The key to reading a sewing pattern is one section at a time. Each area of the pattern envelope, (the front, the back and the top flap) all these areas have information to help in selecting your sewing pattern. If you understand what the information in each section means, the more successful you will be in choosing your pattern and the ultimate success of your finished project. The big pattern companies will reflect the basic information provided here. Skill Level: When you decide what type of project you would like to sew, look at the difficulty factor on the front of the envelope. This will help you decide if you are at the skill level to complete your sewing project. Skill levels will range from very easy to advanced. Size: The front of the envelope will have the size, if the pattern is for clothing. Craft patterns or patterns for home decor will almost always be one size only. Be very careful to choose the correct size. Patterns are not returnable. Note: The size chart will be on the back of the pattern. In most cases it will be on the flap at the top of the pattern. Pattern Number: If you are purchasing your pattern from a fabric store, you will look at the pattern number, write it down and go to the pattern drawer for that brand of pattern. You will find your pattern by the number coded system. Pattern View: The front of the pattern will have a photo image or illustrated image of what the finished project looks like. In most cases, the pattern will come with variations of the finished project, such as sleeves or no sleeves etc. Each image will be called a view A, view B, view C etc. Some of the information on the back of the pattern will be repeats of the front of the pattern. Size Chart: The size chart can be found on the flap at the top of the pattern. Choose your size by your measurements on the chart. Don't panic if you notice a difference in sizes compared to your retail ready to wear garments. Sewing pattern sizes differ from ready to wear. I wear a size 2 in ready to wear, but I am a size 12 in sewing pattern sizes. You will see bust, waist, and hip measurements. If your hip size for example is in the next size category larger than for the bust or waist, choose the larger size. You can always alter the pattern for larger size patterns easier than to adjust from a smaller pattern size. Description of the garment: In this section there will be a description of each view of the project. An example description would be "close fitted tunic". View A B C have a scoop neck. View B has short sleeves. Notions: The notions section is where you will see the supplies you will need in addition to the fabric. For example, if you need a zipper or buttons, bias tape, elastic etc. Note: Each view may have their own unique notions necessary to make the project. This information will be noted for each view. Fabrics: Here you will see what type of fabric is needed or best suited for the project you have chosen. Some sewing patterns are strictly made for stretch knits and this will be indicated on the front of the envelope. Each view may have a different or the same fabric and this will be indicated. For example, if the pattern includes a top and pants, the fabric for the top could be a jersey knit but the pants could be a light weight wool. How much fabric is needed: Here you will see a chart that indicates the amount of fabric to buy. This depends on the size of your pattern and the view you choose, as well as, the width of the fabric you choose. On average, fabric bolts come in 45 inch or 115cm or 60 inch or 150cm widths. This section of the pattern will tell you how much you will need based on this criteria. The pattern will also indicate to buy a little more fabric if it has a nap, one way design, stripes or plaid design. The outline view: At the bottom of the back of the pattern, you will see a detailed outline of the front and back of each view. This will give you a good idea of what the shape of the garment or project looks like. The inside of the pattern envelope: Here you will find all the pattern pieces you need for each view offered in the pattern. As well you will find a detailed instruction sheet/s of how to cut out and construct your project. The line drawings of each view and each pattern piece, detailing each pattern piece by number. Fabric cutting and layout: This will show you all the information about how the each view is laid out on the fabric and sewing information. Note: Read carefully before starting to layout and cut. Glossary: This will give you a description of the sewing terms used in the step by step instructions. The step by step instructions: Each view may have their own special section of instructions. The pattern will indicate which set of instructions pertain to each view. Now you should be a little more confident in reading and choosing a sewing pattern.